I spent Tuesday and Wednesday at Bright House watching the Phillies beat Pittsburgh and Baltimore. They are 7-3 with 2 ties (against Toronto and Detroit). They also have 2 wins against the Yankees and a second win over the Pirates. Time to upgrade those win predictions for 2016! Tuesday, the Phillies opened up a 4-0 lead against the Pirates on a line drive, 2-run home run by Darin Ruf into the bullpen in the first inning and a 2-run triple by Cesar Hernandez to center field in the second inning. Adam Morgan pitched 3 shutout innings. In the first inning, he threw nine 91 mph FB and a 92. Over the next 2 innings, he threw 12 FB – 2 at 91 and 10 in the 92-94 mph range. If the stadium gun is accurate, this is encouraging. Chris Leroux – high 80s FB, gave up the Bucs only two runs ending a stretch of 15 scoreless innings against Phillies’ pitching. Wednesday, the Phillies won a split squad game 8-4 against the winless Orioles. Prior to the game, the fans in the Tiki Terrace and Frenchy’s were bombarded by home runs during BP undoubtedly assisted by the strong wind blowing in that direction. Darin Ruf provided the offense again with 2 HR and 3 RBI in his first 2 AB. The first was a line drive, 2-run laser that landed in the Terrace off Gallardo. The second was a towering, solo blast into the bullpen off Vance Worley. Neither appeared to be wind-aided. Both were off right-handed pitchers. 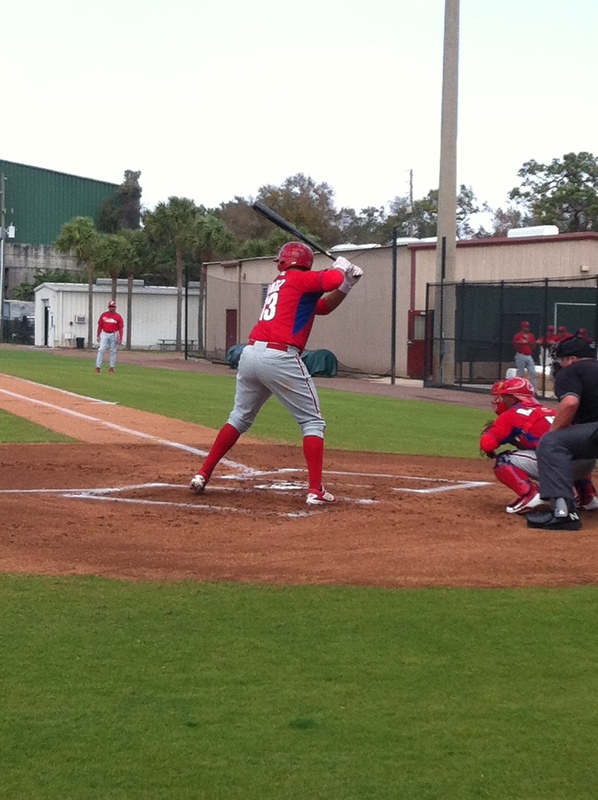 Odubel Herrera added 2 RBI and Taylor Featherston, Logan Moore, and Cameron Perkins added one each. Alec Asher got the nod when Hellickson came down with the Hendu flu. He pitched three innings and gave up a 2-run HR (Machado) to start the third that allowed the O’s to close the score to 3-2. Other than that blip, Asher was effective with a 90-91 mph FB, T92. He struck out five. Seve Gonzalez tossed 3 shutout innings. His FB was 91-92 mph, he struck out 2, and the only base runner he allowed (a single) was erased on a double play. Greg Burke the through the 7th inning with upper an upper 80s FB, but gave up a 2-run HR in the eighth. Hector Neris recorded the final 5 outs (2 K) with a low 90s FB to earn the save. Manager Bowa emptied the bench and guys with na name on their jersey and numbers in the upper 90s took the field during the last couple innings. Perkins entered as a pinch runner for Peter Bourjos and scored a run and picked up an RBI when he beat the relay on a DP attempt in an 0-2 afternoon. KC Serna lined a single to center and fininshed the game at third base. Angelo Mora took a called third strike and played second base. Thursday, I watched the minor league work groups in two intrasquad games. Groups one and two played on Roberts Field and groups three and four played on Carlton Field. This was akin to being a kid in a candy shop. My notes have no continuity as my attention shifted from one field to the other. Add the fact that coaches and pitchers not scheduled to pitch were available between the fields and you had a “target rich” environment. Franklyn Kilome had my full attention as he started for G3 in the 3-4 game. He pitched to 6 batters to get his 20 pitches. This was a pattern for all pitchers. Innings were extended or called dependent on the pitch count. Eighteen pitchers saw action in each game. There were no radar guns at the Complex, so no velocity to report. Back to Kilome. He faced Juan Luis, Bosheers, Tomassetti, Martelo, Zier, and Ortiz. Luis tried to bunt his way on and Kilome jumped on the attempt to retire him at first. Bosheers made the best contact and drove a ball to deep center field where the ball was dropped. I think the fielder was Reggie Wilson. I think the ball should have been caught, but I’ve seen scorers judged differently. I am considered a notorious pitchers scorer down here. Kilome struck out Tomassetti and retired Martelo on a soft fly to right. He had thrown only 12 pitches and continued to retire Zier and Ortiz on ground balls to third. Cuicas made nice plays on both balls. 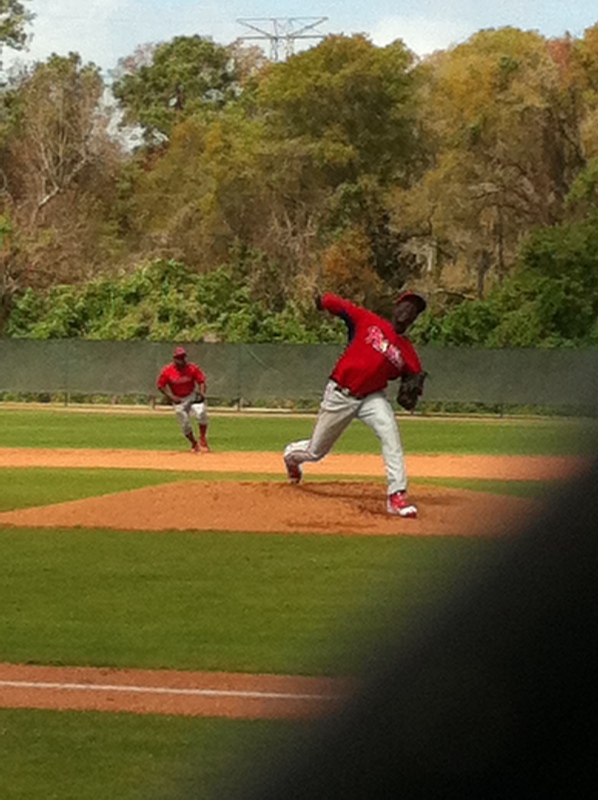 Franklyn Kilome firing through on a pitch. No velo on Kilome, but his pitches had a good downward plane, low in the zone. Ricardo Pinto pitched the home half on the other field and retired the side on ground balls to short. Adonis Medina pitched the second inning for G3. He had a similar downward plane as Kilome, but appeared to lack the velocity and wasn’t as consistently low in the zone. The G4 batters jumped on his first pitch and recorded 2 ground outs and an infield single (Gamboa). Greg Picket launched a deep fly to left center that hit off the bottom of the fence for a run scoring double. He was picked off second before Tomassetti crushed a home run among the cars parked beyond the left field fence. Martelo followed with a double off the left field fence. Edgar Garcia pitched on a nice down hill plane. He gave up a Texas Leaguer to right that Ortiz mishandled into an extra base. His inning was rolled after a BB. Denton Keys struck out Luis, gave up a single to Bosheers and walked Tomassetti. I switched fields when I heard Eshelman was on the other mound. Tom Eshelman threw 15 strikes and 5 balls among his 20 pitches. Brian Pointer fisted a 0-1 pitch to first for a 3-1 putout. Joel Fisher struck out on 3 pitches. Jake Fox took the kid to school (after the second pitch was up tight and had Fox laughing with the umpire) when he deposited a 1-1 pitch over the left center field fence. Eshelman responded by retiring Charles on a 0-2 ground out and Pullin on a 1-0 ground out to second. He got ahead of Jesse Valentin who fouled off a couple 3-2 pitches in a 7-pitch at bat when the inning was rolled. Eshelman seems to be as billed. He’s around the strike zone but doesn’t appear to have big velocity. He will probably experience less success as he moves up the organizational ladder unless he develops more velocity or a killer out pitch. Jake Fox proved that. Later an innings was rolled with Brian Pointer batting and Fox on deck. I happened to be next to the on deck circle and overheard Fox bemoaning the fact that the inning was rolled and he would have to face the hard throwing “Trinidad” (Tirado) next inning. Well, Tirado came on throwing heat with a modicum of control. Pointer lined a 3-1 pitch over the first baseman into the right field corner for a double. The strike came on the first pitch, BTW. Having watched that series of pitches, Fox jumped on the first-pitch fastball and drove the pitch to the left center field fence where it was caught. Just missed his third HR of the day. Looks like a dangerous hitter. I saw Ortiz K twice and work a walk when behind in the count. He fouled off a tough pitch to stay alive for the walk. I watched Jairo Munoz pitch, uninspiring. Group 3’s starting outfield was Amaro-Wilson-Pujols. Biter replaced Amaro later in the game. I also saw Coppola and Duran in the game. No Randolph. WTF. I talked to Bailey Falter and Evan Crower. They will both pitch today, as will Ranfi Casimiro. Intrasquad games are scheduled again today at 1:00PM. I think these are better circumstances for watching and assessing players. I am planning my day around attending. I may just stick with one game today with less movement between the fields. I want to see Falter and Crower throw, and Randolph and Ortiz hit, so looks like the G3 v. G4 game. Great stuff Jim thanks! Very encouraging about Morgan, like you said if the gun is accurate. Appreciate the recap. I hope you’re enjoying getting back to real baseball. I love hearing these anecdotes about Jake Fox. He sounds like the hitters’ version of Crash Davis, helping guys along but enjoying himself and setting a positive tone for the young guys on the team. ‘throwing heat with a modicum of control.’…love that. If Tirado can only harness that control, what a pitcher! – Goeddel is really thin/lanky. Still trying to keep it going in the major leagues. Quinn has 3 triples already in only a few at bats. He gets me very excited by his healthy potential. I agree Murray. Quinn’s ultimate outcome is somewhat uncertain, but his ceiling is high – really high. If he becomes all that he could be your are looking at a true all-star, a scintillating player. I agree Murray. I say when I’m wrong and I’ve been wrong on Quinn. I thought his leg injuries the last two years would hold him back from realizing his full potential. Plus the lost development time concerned me. He’s right back where he was, like he never left. I hope he plays most of his games this year at AAA. With Nick Williams at AAA to start, they may start Quinn in AA. If he continues to play like he has in big league camp. he’ll force them to move him to AAA quickly. Williams and Quinn in the same OF will be very exciting to watch, in the field and with the bat. Throw in Crawford and the AAA team could be better than the big club. It will be interesting to see where they place JP and Quinn. I think they’re going to AA initially but I could be wrong. Nick Williams is not a CF by my eye and the team would probably love to have Quinn and Williams play together (they haven’t yet). Aaron Brown could play CF at AA. We’ll see…. 5. Alfaro or Knapp or Hoskins or Cozens. Fun, if we can be so lucky as to have a good number of these guys live of up such a dream. FranF…I guess Herrera is not in your picture? He could be a candidate for a future 2nd base job in 2017 or 2018…especially if all the OFers turn out as expected AND he also keeps hitting. I’ve been a Roman Quinn fan ever since I saw him play at Clearwater but I’m nervous every time he turns on the speed that he’s going to rip something and lose the season. Hopefully, he just ran into a weird streak of bad luck and is really put together well enough to play regularly at — no pun intended — full speed from here on out. No reply button on Romus’ comment, so I answering on this one. Romus, that’s what you call a big oversight on my part. Maybe we plug Odubel into the 3 slot for now. I don’t know if this will be his final assignment, but Henson is coaching with the Shawn Williams work group which would seem to indicate Lakewood. Who do we think has a shot to produce a WAR like Kiermaier and Pillar that is based mostly on Defense? I am very high on Quinn, and it is a shame we will miss Altherr all year. Doobie really played great D by the end of last season, but I don’t know what his ceiling is. 1) Which position do you see Cornelius Randolph settling in at? Is his hitting strong enough for a corner OF spot? Will he be a 2nd baseman? 2) We were all excited to see the development of Odubel Herrera last year. Will he stick in CF (keeping in mind the development of Roman Quinn, who is by all accounts a very strong fielder)? Does he have the ability to play 2nd base or corner OF? 3) Who do you think will play 1st base in 3 years time? Is Rhys Hoskins the real deal? Do you think there is a possibility of Jorge Alfaro/Andrew Knapp playing there? Let me know what you guys think – I am very interested to hear and am looking forward to seeing the further development of our prospects at all levels!